Burn scars, along with the associated skin grafted areas, serve as very unpleasant and painful reminders of a past traumatic event. 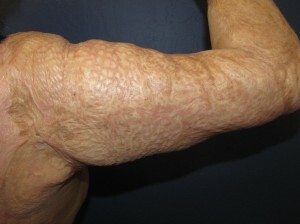 Such scars may be the result of not only thermal injuries but also electrical or chemical ones. Treatment of them is sought not only for improvement of the appearance of the affected area(s) but also to help with emotional related issues as well as functional ones. Given the limitless spectrum of burn scar presentations, treatment needs to be individualized to the particular patient, area(s) and deformities. Such a plan needs to comprehensively address both aesthetic and functional factors. There are a variety of surgical approaches that can be employed to treat burn scars. 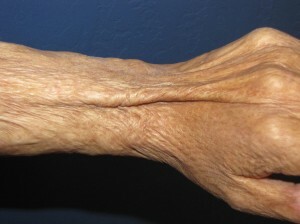 Patients with extensive and complex problems may benefit from the application of multiple techniques. Some of these can include direct excision of the burn scar, serial reduction of the affected area (repeat partial excisions), release of scar contractures, usage of tissue expansion, skin grafting, z-plasties and other flap procedures (moving tissue in from the surrounding areas). For example, burn scar contractures can be very debilitating. Release of these along with the appropriate treatment such as skin grafting and flaps can allow a person to regain crucial function and range of motion particularly when it involves the fingers, hands, wrist and other joints. For more information about burn scar restoration, or to schedule a consultation with board-certified plastic surgeon Steven H. Turkeltaub, MD to find out which treatment may be best for your unique needs, please contact our practice online or by phone today.